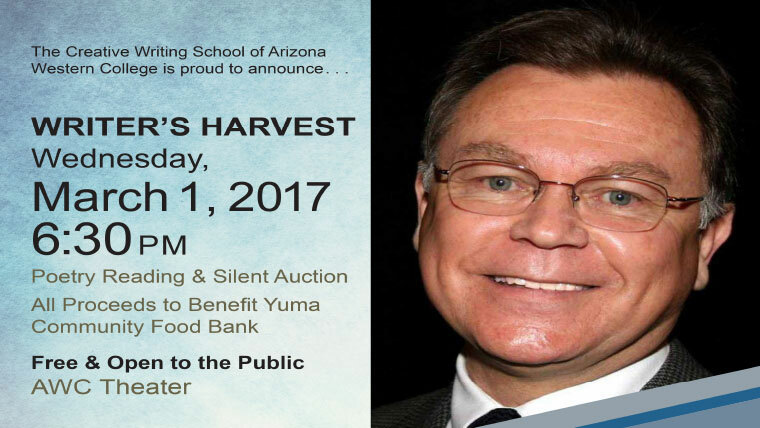 Yuma, AZ (February 23, 2017) –The Creative Writing School of Arizona Western College will be presenting “Writer’s Harvest” on Wednesday, March 1st at 6:30pm in the AWC Theater. The event will include a silent auction and a poetry reading by Alberto Alvaro Ríos, Poet Laureate of Arizona and National Book Award Finalist. All proceeds from the auction will benefit the Yuma Community Food Bank. Ríos is the author of ten books and chapbooks of poetry, three collections of short stories, and a memoir. Ríos is also a Regents’ Professor at Arizona State University, where he has taught for over 30 years. Arizona Western College is thrilled to have Ríos serve as the 2017 Distinguished Visiting Writer. The public is invited to attend this free event. For more information, please contact Dr. Eric Lee at eric.lee@azwestern.edu or (928) 344-7738. On the border between Mexico and the United States. In Mexico it was the dia de los Refugios.